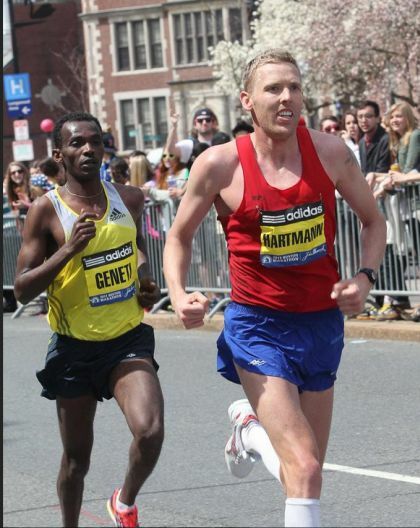 Jason Hartmann, with consecutive fourth place finishes at Boston, is the top American in the World Marathon Majors 2012-13 leaderboard. In episode 14 we interview the modest gent about his career, this fall’s NYC Marathon, his coaching of high school phenom Elise Cranny, and Competitor Group’s decision to eliminate its elite athlete program. We also find out what shoes Hartmann (who is without a shoe sponsor) prefers to train and race in. Elsewhere in the episode, we offer praise and criticism, respectively, for David Epstein’s “The Sports Gene” and Malcolm Gladwell’s New Yorker article on genes and drugs. We climb on the soapbox to add our two cents to the Competitor Group discussion. My take-away from Epstein’s book is that it’s 100% nature and 100% nurture, which I thought and then found in the epilogue. In order to compete at the highest level one must have certain physical advantages. One may be more likely to have such advantages by being a member of a particular tribe — and the core of the book is to delve into how genes create physical characteristics that are good or bad — but they must be there. From that how the individual exploits those advantages will turn on one’s environment. I think a nice companion piece to that book is Malcolm Gladwell’s New Yorker profile of Alberto Salazar, on the ability, or willingness, to tolerate pain. I also think useful companions are Tyler Hamilton’s “The Secret Race” on how drugging in cycling worked and David Walsh’s “From Lance to Landis”, which was more of an outsider’s look at the same issue. I don’t think Brenn is fair to Gladwell’s most recent effort though. It’s not simplistic (I’ve never found Gladwell to be that) but raises a “contradiction” in sports. I took him, Gladwell, to be suggesting that as soon as one does something to alter her physical condition, it is not clear where the line is. He cites Tommy-John surgery — one-third of MLB pitchers apparently have had it. Why is that, he wonders, or laser surgery on the eyes different in any ethical or moral universe from taking EPO to increase the amount of red-blood cells rushing through one’s veins? Something is done to alter one’s ability to perform. Thanks for the suggested readings and concise summary of the Gladwell piece, Joe. We see it a bit differently. I think Gladwell’s final sentence, “Hamilton and Armstrong may simply be athletes who regard this kind of achievement as worthier than the gold medals of a man with the dumb luck to be born with a random genetic mutation,” is evidence of Gladwell oversimplifying. At the very least, those bikers knew that far more than genes would be involved for whoever would win the Tour de France. It was a dirty game that they wanted to win, period. Granted, the “genetic mutation” is a reference to the Finnish cross-country skiing medalist Eero Mantyranta mentioned at the start of his article, but why would those cyclists care one way or another about how people in other sports got their medals? Gladwell does have some authority as a distance runner (he just ran 5:03 in the 5th Ave Mile. Not bad! 84.24% AG). I hope he keeps writing about running, but I think he’s certainly in a position to write a deeper piece about the spirit of competition within the sport.